The fabulous Bellagio Resort & Casino in Las Vegas is a AAA Five Diamond property that’s famous for being modeled after the beautiful villages of Europe and of course – the amazing Mediterranean-blue lake and water fountain show. 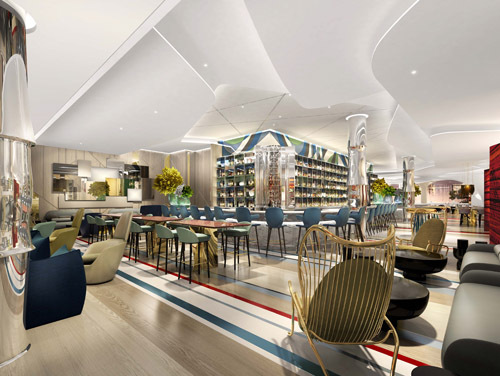 Opening in March of 2015, Lago by Julian Serrano will be a new Italian restaurant concept from one of the most celebrated chefs in Las Vegas. Lago will feature a luxurious dining room with stunning floor-to-ceiling panoramic windows, thus allowing sensational views of the Bellagio resort’s iconic fountains. Next to the dining room, patrons can enjoy an open-air patio and experience waterfront seating on beautiful, 8 1⁄2-acre Lake Bellagio. Lago will become the first Italian restaurant from the Michelin-decorated and James Beard Award-winning Chef Julian Serrano. Lago will feature a small plate menu to celebrate the creativity and signature flavors of Chef Serrano. In addition, Lago restaurant will introduce a sophisticated mixology program with unique preparations. The small, savory Italian dishes will deliver reinvented presentations so restaurant guests can enjoy eating a wide variety of cuisine from Chef Serrano. Dining selections will include carpaccio and bruschetta; an assortment of pizzas; fresh pastas such as risotto and gnocchi; in addition to delicious tasting, main dish such as salmon, steak and chicken. The interior of Lago restaurant showcases a façade to immediately capture the attention of dining guests and seen from across the Bellagio resort. Upon entering Lago, you are enveloped in a colorful, 15 by 100 foot mosaic that’s made from Italian glass and portrays an aerial map of Milan, Italy. If you would like to enjoy a nice cocktail before or after your meal, try the intimate lounge with a gorgeous glass-and-chrome mixology counter. If you are looking to book a vacation to Las Vegas and would like to enjoy fine dining at its best at Lago restaurant in the Bellagio Resort & Casino, contact us. The Life of Luxury can assist planning and booking your entire itinerary. Read about other luxury travel news by following this luxury blog.